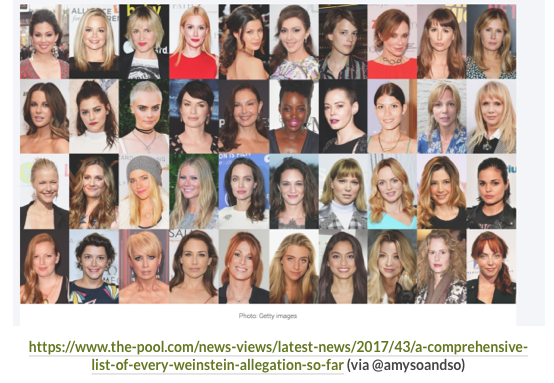 In the weeks since The New Yorker published Ronan Farrow’s well-evidenced article into Harvey Weinstein’s history of sexualised violence, there has been a plethora of new allegations about Weinstein, but also what is beginning to feel like the majority of men in Hollywood, politics, sports and music. I’ve been trying to boycott abusive men for years, but it is so difficult when they are protected from the real consequences of their behaviour by those who value profit over the safety of women and children. You only have to look at the careers of Woody Allen and Roman Polanski. And, now, Harvey Weinstein. The sheer number of allegations and the multiple perpetrators named in the past few months make it difficult to keep track. This is why Everyone Knew was born. There were just too many men. And, a huge discrepancy in which men are being held accountable: Casey Affleck and James Franco were effectively uninvited from the 2018 Oscars because of allegations of sexual violence against women. Yet Gary Oldman was not only invited, he won the third most coveted award of the evening (Best Picture and Best Director) despite a history of domestic violence agains multiple partners (and a history of racism). The list isn’t exhaustive and I can’t keep up with all the allegations being made. But, I needed to do this list. So, we can stop talking about ‘isolated incidents’ and ‘everyone knew’. To at least try to ensure that men’s violence against women and girls is recognised. So men like Christopher Plummer, with his own history of violence, isn’t considered a replacement to a man fired for his own history of violence; in this case Kevin Spacey. And, men like Matt Damon no longer gets to pontificate on what is ‘real’ abuse, whilst protecting Casey Affleck from the consequences of his actions. Everyone Knew cannot remain a way to erase men’s responsibility for their criminal choices. Those who choose to support these men also need to be held accountable. This list, clearly, won’t change the world, but naming these men is a first step.